Animal organs. Digestive system. Liver. Atlas of plant and animal histology. Technique: paraffin embedding, sectons stained with haematoxylin-eosin. The liver is the largest gland, organ and viscera of the body. It is found underneath the diaphragm and protected by the ribs. It is lined by a capsule of fibrous connective tissue, known as Glisson’s capsule, which penetrates the organ to form septa that divide it into lobes. The liver is formed from an invagination of the digestive tube during the embryonic development; therefore, it is an epithelial derivative. Hepatocytes are the cells that form most of the liver and are responsible for its function. Most of the blood that reaches the liver comes from the portal vein that collects the absorbed products of digestion. The strong blood supply is what makes liver so reddish. The functions of the liver are not only related to the digestive tract, but it develops other functions as well. The cellular organization of the liver is relatively simple based on the repetition of a basic structure called hepatic lobule. Lobules are separated from each other by connective tissue, but this is not clearly visible in all the species. The morphology of lobules is like polygonal prisms, of about 1 to 2 mm in diameter, and, in cross-sections, the lobules are similar to a hexagon containing a central vein of large diameter. The portal areas, located in the vertices of the hexagon, between adjacent lobules, are connective tissue that contains the so-called portal triads. Portal triads are constituted by a branch of the portal vein (venule), a branch of the hepatic artery (arteriole) and a bile duct. In addition, lymphatic vessels and nerve fibers are found in the portal areas. The portal vein carries 70-75% of the incoming blood flow (15 ml/min) and contains poorly oxygenated, but nutrient-rich blood, from the entire gastrointestinal tract, spleen, and pancreas. On the contrary, the hepatic artery carries oxygen-rich blood from the aorta. The blood reaches the blood vessels of the portal areas, transporting the substances from the digestive system, whereas the central vein drains the result of the hepatocyte activity. The portal vessels and the central vein communicate with each other through capillaries, known as sinusoids, running between the hepatocytes. Sinusoids have walls formed by a discontinuous lining of fenestrated endothelial cells that lack a basal membrane. The sinusoids stream flows in a radial manner, collecting the fluid of the portal veins and arteries at the vertices, as well as the endocrine secretion of the hepatocytes. Sinousoids converge in the center of the lobule to release their content into the central vein. The convergence of the central veins from different lobules gives rise to the hepatic veins that are ultimately drained in the inferior vena cava. Scanning electron microscope image showing hepatocytes. Note the presence of sinusoids located between the layers of hepatocytes. The irregular channels of small diameter correspond to the bile canaliculi, which are formed by the apposed cell membranes of adjacent adipocytes. The bile ducts of the portal triad collect the exocrine content, or bile, produced by the hepatocytes. Bile flows in the opposite direction to the blood that runs through the sinusoidal capillaries, in other words, it is directed from the hepatocytes to the bile ducts of the periphery of the hepatic lobule: the portal areas. This is possible because the plasma membranes of adjoining hepatocytes form interconnected spaces, the bile canaliculi, which are organized in an anastomosed network that finally fuses with the bile ducts. 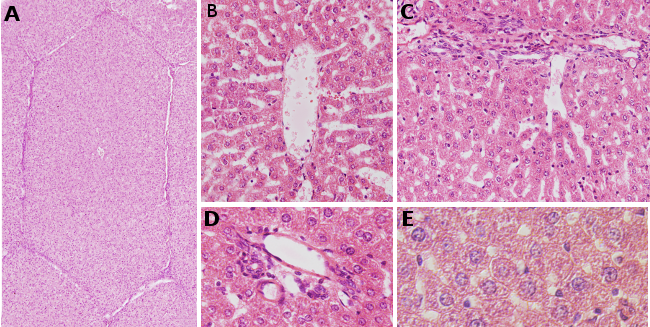 Hepatocytes represent more than 75% of the liver and are organized in anastomosed layers, or trabeculae. These layers of hepatocytes are usually one-cell thick and fused together to form a complex structure similar to a sponge. Small diameter sinusoids run between the layers of hepatocytes. Between the endothelium of sinusoids and hepatocytes there are free-cellular spaces known as perisinusoidal spaces or spaces of Disse. Hepatocytes release two types of substances: endocrine toward sinudois and exocrine toward the bile canaliculi. Hepatocytes are relatively large (around 20 to 30 μm) with a rounded nucleus, some are binucleated, and most of them are tetraploid. The hepatocytes are responsible for the endocrine secretion of a large amount of plasma proteins, for example albumin and lipoproteins (which transport cholesterol), and glycoproteins, such as transferrin, prothrombin and fibrinogens (which are responsible for blood coagulation). They also store and modify vitamins such as vitamin A, D, and K, and hormones like the growth hormone. Insulin and glucagon are hormones degraded mainly in the liver. Hepatocytes are major detoxification centers participating in the catabolism of toxins and exogenous molecules of the body (like the majority of drugs). They are also important in the metabolism of carbohydrates (glyconeogenesis, glycogenolysis and glycogenesis) and lipids (synthesis of triglycerides and cholesterol). Additionally, they synthesize the majority of the urea produced in the body from ammonium, that will be later excreted through the kidneys. The liver also removes about 20% of the aged red blood cells (the remaining 80% are removed in the spleen) by phagocytosis, performed by macrophages, known as Kupffer cells. Hepatocytes synthesize and release bile. The bile is collected in bile canaliculi that leave the hepatic lobules and merge to form the bile ducts. The bile ducts drain into the right and left hepatic ducts, which exit the liver and merge to form a single duct, known as the common hepatic duct. This duct is connected to the gallbladder, a temporal storage compartment of the bile, by the cystic duct. Finally, the bile runs to the duodenum through the common bile duct. The bile is an aqueous solution containing waste products that are sent to the intestine and be expelled, but also contains useful components that aid in digestion, such as bile salts, proteins, cholesterol and hormones. Bile salts help in the digestion of fats.